RJ launched its now-core base collection ARRAW last year, adding as such a new segment to their existing line and opening up a world of an endless possibilities where not even the sky is a limit. True to the RJ DNA with its recognizable bumpers, shaped lugs and iconic, proprietary arrow-shaped hands, the ARRAW aimed high at this year’s SIHH. 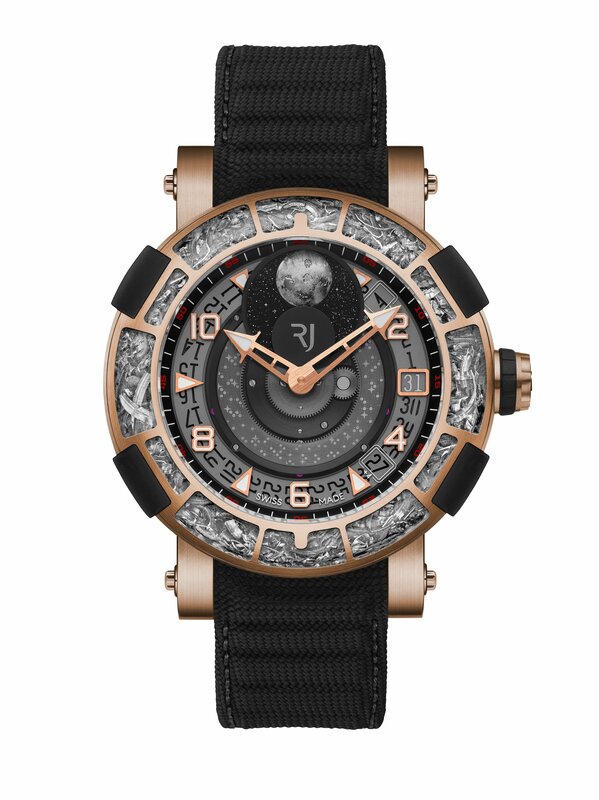 For its all-new ARRAW 6919 line, RJ introduced its first in-house, patented Moon movement and combined it with Apollo 11 DNA to celebrate the 50 years of the first landing on the moon back in 1969. The emblematic RJ ARRAW 45mm case is for the first time totally inspired by space, with a bezel made of super light, hard composite material combining high-performance acrylic glass and parts from the Apollo 11 spacecraft. Available in three different materials: polished and satin-brushed titanium, ceramic and 5N+ red gold, the new watches are both highly horological and aesthetically rich; in fact, the new RJ-2180 mechanical self-winding movement accommodates the patented RJ Moon Phase mechanism that shows a 3D moon rotating 360° during a complete cycle of 29.5 days. 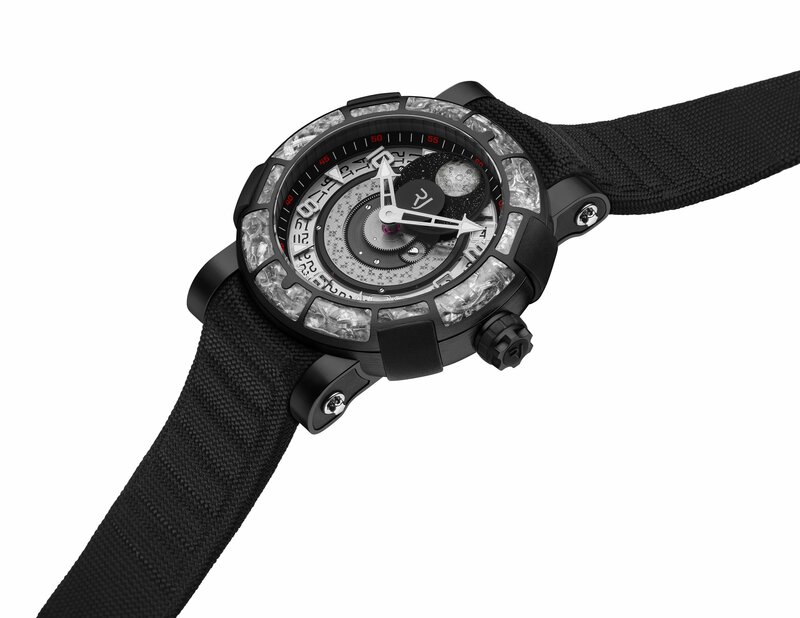 In addition, the hour and minute indicators at the center of the movement also indicate earth’s location. “Milestones in mankind fuel our drive to inspiration. I believe that each significant step leads to a wider world and is helping us to develop innovation in our field,” said CEO and Creative Director of RJ Marco Tedeschi, about the ARRAW 6919. 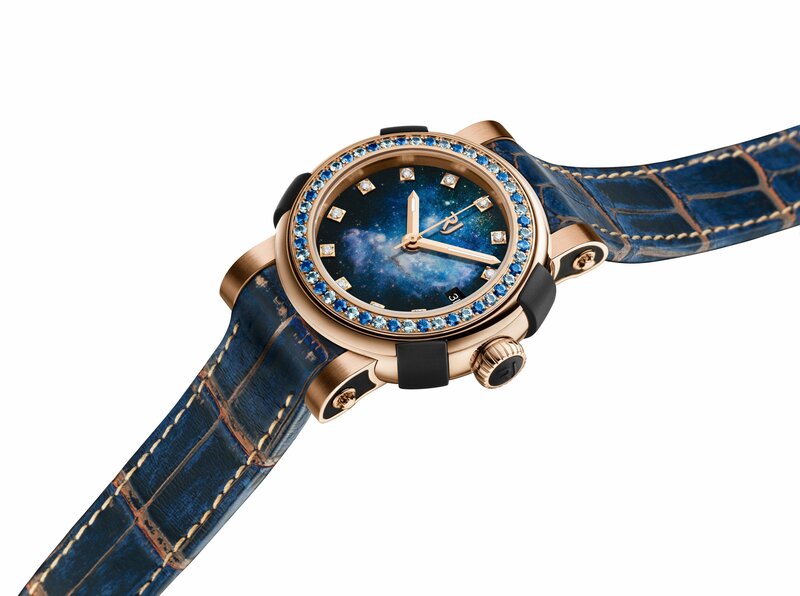 ARRAW Star Twist, the first ARRAW line for women inspired by the depth of space, brings the constellation to women’s wrists. Shining in all the glory of the constellations, the new watches, in titanium or red gold+, elevate 4 different mother of pearl dials each representing a different deep-sky object: Titanium Blue Spiral Galaxy, Titanium Purple Spiral Galaxy,Titanium Glowing Eye Nebula and Gold Blue Magellanic Cloud. The colorful gemstones on the patented spinning bezel of this 39mm high-end mechanical watch are quite eye catching and embody the mystery and diversity of space. If the moon landing was “one small step for a man…” (Neil Armstrong), these novelties are definitely “one giant leap for” RJ!